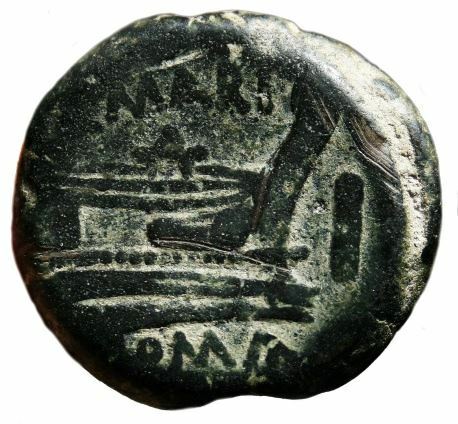 Q. Marius was one of the moneyers for the year 189-180 BC. He is not otherwise known. The gens Maria was a plebeian family of Rome. Its most celebrated member was Gaius Marius, one of the greatest generals of antiquity, and seven times consul. As a nomen, Marius is probably derived from the Oscan praenomen Marius, in which case the family may be of Sabine or Sabellic background, although in this form the name is Latinized, and the family cannot be proven to have originated anywhere other than Rome. The Marii of the Republic were never divided into any families, though in course of time, more especially under the emperors, several of the Marii assumed surnames. On coins we find the cognomina Capito and Trogus, but the identities of the individuals who bore these names is uncertain.